Looking at an adult foot from the inside you will notice that there is normally an upward curve in the middle. The upward curve of the foot is called an arch. Tendons – which are the tight tissue bands connected at the heel and foot bones – forming the arch. The tendons in the foot and lower leg function together to form the arches of the foot. 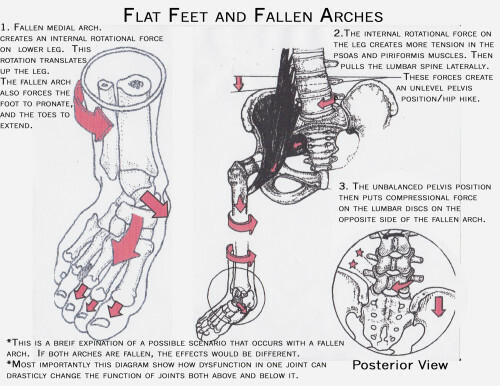 When the tendons all pull the correct amount, then the foot creates a moderate, normal arch. When bonds do not pull together properly, a little arch or no arch at all is formed. Step away and look at the footprints. If you see complete imprints of the bottom of your feet on the surface, you likely have fallen arches. Many young then have falt feet; a condition is known as flexible flat feet. When a child stands the feet look flat. However when the child rises to his/her toes, a slight arch will appear. Most children will grow up and develop arches. For feet in adults can rise from many different causes. Here is a list of possible factors leading to fallen arches. A torn or stretched tendon. Damage or inflammation of the posterior tibial tendon, which attaches the lower leg and the ankle to the middle of the arch. Inside bottom of your foot is swollen. If you notice any of these symptoms, you should contact your doctor. 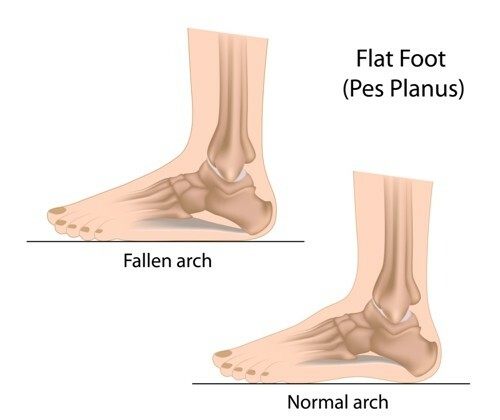 To determine if you have fallen arches, your doctor will look for signs and symptoms and possible cause, through a physical exam. 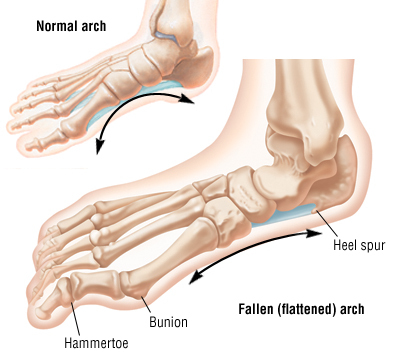 Checking your health history for evidence of illness or injures that can cause fallen arches. Taking MRI or X-rays of the feet. SObesving the legs and foot as you stand up and od simple movements such as standing on the toes and walking. Pain relief medications, such as nonsteroidal anti-inflammatories. Osteotomy Cutting or changing the shape of the foot bone. Attaching tendon from other parts of your body to tendons in your foot to help balance the “pull” of the tendon and create the shape of an arch (through tendon transfer. Wear footwear or she inserts that work for the appropriate to your activity. When pain occurs you should try rest, ice and over-the-counter NSAIDs, such as ibuprofen. Ask your doctor or physical therapist fo stretches that you can do at home, that can prepare you for actives that will require you to use your foot. Limit the risk of fallen arches and flat feet, by managing risk for diabetes, high blood pressure, and obesity. Ask for help if severe pain interferes with your daily activities.